This Wednesday, May 27th, 2015, Tamara Sol Farías Vergara was transferred to the ill-named “Centre for Feminine Orientation” (COF) located at Vicuña Mackenna and Capitan Prat streets in San Joaquin, Santiago. On 5 May, the court of appeal dismissed the application for revocation of the decision which had sentenced comrade Tamara Sol to seven years, six months and a fine for the shooting of a security guard in a branch of Banco Estado. On hearing the decision unrest broke out in the courtroom and on the street outside the building, which resulted in five arrests. We would like to share with you the status of the legal situation our Tamara Sol is facing, prisoner in San Miguel jail in a “high security” module, since the 21st of January. She has lived this year along with other compañeras locked down for 23 hours a day with one hour to go out to the yard. She receives two visits a week, 5 people on Monday and 5 people on Friday (two hours each time). Tamara is accused of “attempted murder” and robbery. The prosecutor asked for 7 years without benefits*, from the first day she was detained. According to info received, Tamara Sol was found guilty by the court and sentenced to 7 years and 2 months in prison, with a fine of $215.000 (US$ 345 – €300). Recall that Tamara Sol is the comrade who was arrested after a BancoEstado security guard was shot in revenge for the death of Sebastián Oversluij Seguel. Theft [of the gun of the security guard who was shot]: 61 Days + fine. After the trial, there was clashes between Sol family’s and the tribunal guards (gendarmes). The family rebuked the judges and threw leaflets, calling the judges “fascists” and accusing them of developing a biased and political judgment. Also, the judges order to take a DNA sample of Sol, to include it in the National Register of Convicted. However, there still exists an appeal opportunity against the sentence. 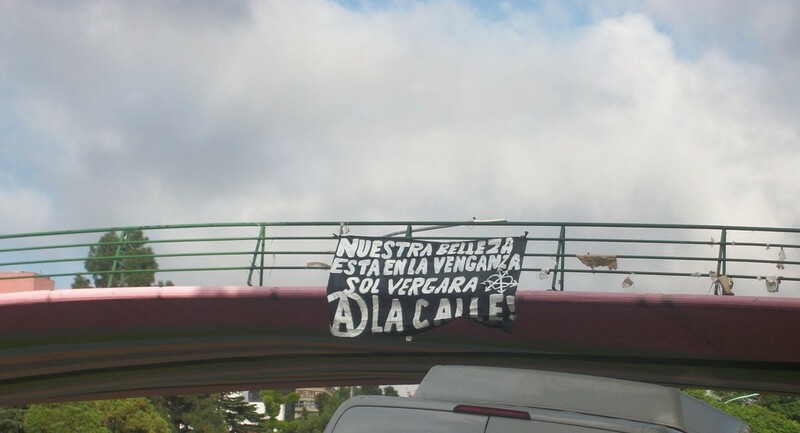 After one year of detention in San Miguel prison, anarchist comrade Tamara Sol started to face the trial in which power aims to annihilate her. Tamara is accused of shooting a bank guard in January 2014, just days after a bank guard killed comrade Sebastian Oversluij in an attempted bank robbery, in a different bank branch. 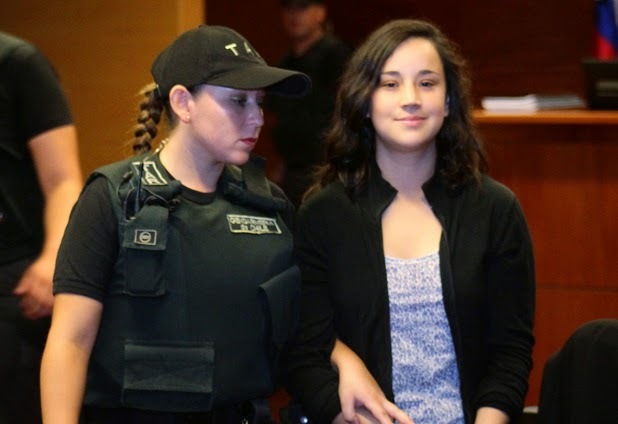 The preliminary hearing of the trial against comrade Tamara Sol Farias Vergara took place in Santiago on Monday 24th November. Tamara has been held prisoner in the jail of San Miguel for almost a year on charges of attempted murder and theft. During the hearing defence lawyers and prosecutors submitted evidence reports, witness statements and other findings. The court rejected about 28 witnesses for the prosecution, most of them cops of OS-9 and bank employees. Many of them did not even witness the events that led to Tamara’s arrest. The judge also accepted a defence lawyers’ request and rejected other evidence, findings and materials presented by the prosecution and the representative of Banco Estado (the claimant). There was a strong presence at this first hearing of comrades who have expressed solidarity with the comrade and her family from the start. But the comrades had to stay outside the court as the judge ordered the hearing be held behind closed doors. In spite of this Tamara managed to hear the slogans shouted by the comrades outside. The triad of judges will be appointed and the date of the start of the trial fixed in the next few days. Solidarity and complicity with Tamara Sol! Frente al silencio cómplice un grito por la solidaridad! Spread the revolt for the total liberation with all forms of struggle, and against all authority!! In the last few weeks, we have seen through the media how the Powerful have initiated a new offensive against the anti-authoritarian/anarchist community. Once again, we can see how the newspapers and news channels have propagated the idea of trapping those responsible for various arson attacks and explosions that have taken place since 2011. Alleged suspects are turned into convicts through the media, with the end of validating future repressive waves unto so-called “public opinion,” unleashing possible identities, accusations, and investigative lines. I thank you so much for your support, I can feel your unconditional love deep in my heart. Any letter, note, delicious sweet or money support is a joy and an injection of energy in this cage. Taking advantage of the fact you’re all meeting there, I’m going to clarify some doubts that apparently are circulating here and there. Este sitio web pretende difundir la situación jurídica-política de los compañeros Alfonso Alvial y Hermes Gonzales, encarcelados desde el 11 de diciembre del 2013, luego de un operativo policial en respuesta a un supuesto intento de expropiación a un banco de la comuna de Pudahuel. Acción repelida por el guardia armado de la sucursal que termina con la muerte del compañero Sebastían Oversluij “Angry” Seguel en el lugar.